Do you like cute little animals? The hamsters live in a beautiful pet home. 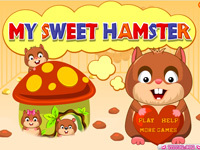 In the first level you have to take care of 1 hamster. You can pick up the hamster and put it wherever you want it to be. Feed it, give it something to drink, let it run in its hamster wheel to get some exercise and stay healthy, and so on. Pay special attention to its teeth: if they grow too long, it will escape! In this game there are several levels. In every level you get one more hamster to take care of.